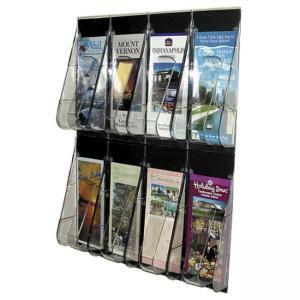 Wall-mountable literature rack offers eight pamphlet-size pockets with a two-row height. Break-resistant pockets are attached to black plastic panel. Stand-Tall unbreakable tongue offers a spring-action to keep material from slumping. Literature rack includes mounting hardware. $55Rubbermaid Classic Hot File Letter Starter Set - 17"
$79Rubbermaid Classic Hot File Hanger Set - 21"